So I haven't abandoned this blog! 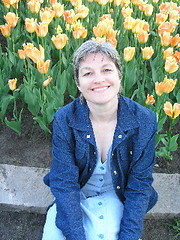 First I was away, then I was sick, and now I am blogging on my other blogs. 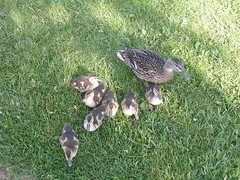 But today I finally went back for a run in the park and saw baby geese and ducklings! I brought my camera with me while I went running and saw the fluffy babies on the first pass. When I came around the second time, I stopped to take pix. 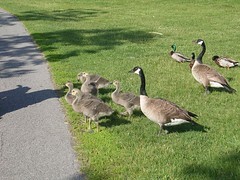 An older man with his grandson in a baby carriage had stopped along the path and he started throwing bread to the birds. They were up and running toward him in a flash. 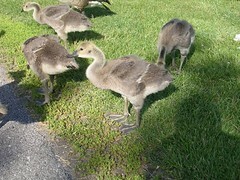 They didn't seem shy at all, not even the goslings. 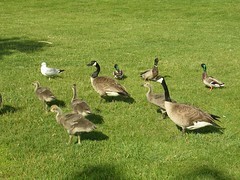 But the parents were pretty aggressive with the other birds. Don't they look like fluffy dinosaurs? 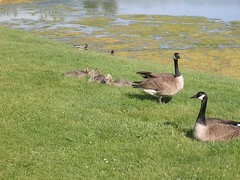 These two parental geese were giving me the hairy eyeball, as I was trying to get close for pix. One of them took a chunk out of a duck that got too close too - there was a wad of feathers on the grass and the duck limped away after that. 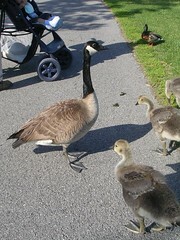 I scolded the goose but got scolded by him in return. 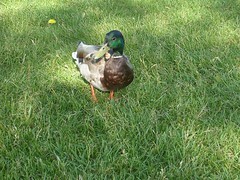 This duck was limping too but for a different reasons - he might be Waddles One-Foot! You can't tell from the photo but he was missing his right foot. Of course, I can't tell or remember which foot Waddles was missing but anyway. Here's his faithful missus with their seven children. 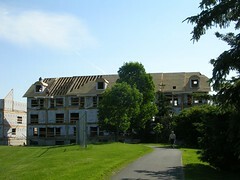 To round it off, here's the progress of the construction to date. The first row done by the road has roof vents on and everything. This is the one where the back "yards" will be sitting right on the bike path. But here is what it looks like from our quad. 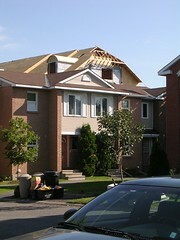 It looms over the houses by the park. Well, it doesn't look that loomy here but believe me, there is looming. And the constant noise is driving those guys crazy. Logan may seem nonchalant but one day, when Uma was about 11 years old, her retriever genes suddenly were made manifest and she started retrieving things from a lake. It may suddenly occur to Logan that he should be fetching those ducks, and then look out! Fluffy dinosaurs -- I love it! And I sincerely hope it IS Mr. Waddles, too. Jenny, they did remind me of some of those dinos in "Jurassic Park"! More pix today! Fluffy Dinosaurs could be the next great toy sensation! ML, who should I talk to!? Just kidding, I don't see myself inventing a toy. They are cuter in real life anyway, fully animated and with little peeping voices.